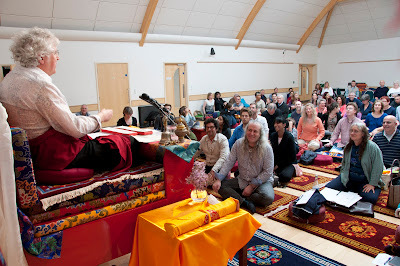 On Saturday 11th May Lama Jampa Thaye gave teachings in Bristol, England. In the morning he continued teaching Jetsun Drakpa Gyaltsen’s commentary on Chandragomin’s ‘The Twenty Verses on the Bodhisattva Vow’. The text continued its detailed presentation of the bodhisattva path, looking in particular at faults to be avoided in the practice of the six perfections. The final part of the text will be taught in Bristol on Saturday October 12th 2013. In the afternoon Lama Jampa bestowed the initiation of Sakyamuni Buddha and the Sixteen Sthaviras from the lineage of Atisha. 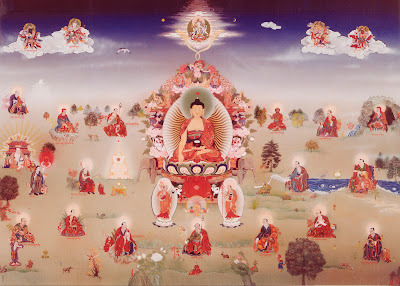 At the end of the initiation he gave the reading transmission (‘lung’) for the puja commonly called ‘The Sixteen Arhats’ which is done at Dechen Centres on each of the four holy Buddha days of the year. The full title of the puja is ‘The Liturgy of the Concise Puja of Prostrations to the Sthaviras together with Offerings’ and was composed by Shakyashri. The next Buddha Day is Saga Dawa Duchen on Saturday 25th May. This is the most important of the four, being a celebration of the three events of Buddha’s birth, enlightenment and parinirvana. Please check your local centre calendar for details. At the conclusion of the day's teachings Lama Jampa gave the reading transmission (Tib. lung) for the collection of spiritual songs by Bongsar Jamyang Tenphel which has just been published by Ganesha Press and is called "Ladder of Enlightenment". 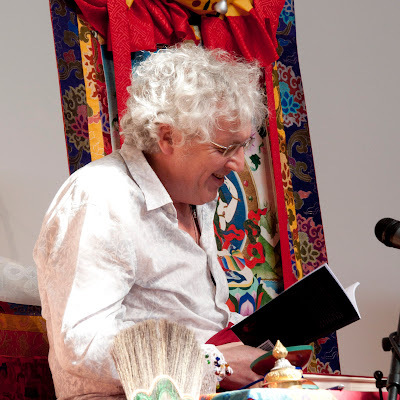 Lama Jampa’s next teachings will be in London on the 8th June when he will teach Gyaltse Thogme Zangpo's commentary on the Seven Points of Mind Training Part 1 and bestow the Initiation of Gonkar.